Rob Wassenaar pitched well in this August 1989 game, just not well enough. Pitching for AA Orlando, Wassenaar went eight, gave up two late unearned runs and struck out seven, The Orlando Sentinel wrote. But he still got tagged for the 2-1 loss. "Baseball's funny. I've pitched poorly before and gotten the win," Wassenaar told The Sentinel. "It's great playing with these guys, and generally they're going to score a lot more runs." Wassenaar threw that game in his third season as a pro. He ended up playing in four more seasons, making AAA, but never making the majors. Wassenaar's pro career began in 1987, taken by the Angels in the 21st round out of Stanford University. Wassenaar went to Stanford out of Edina, Minn.
At Edina, Wassenaar helped his local American Legion team to the 1983 Legion World Series, and to an early win with a four-hitter. "This was one of my best games," Wassenaar told The Reading Eagle after beating a Reading-area team. "But it had to be, because this was the best team we've ever played." After going to Stanford, Wassenaar landed with the Angels. With them, Wassenaar started at short-season Salem, posting a 2.14 ERA over 31 relief appearances. He then moved to single-A Quad Cities for 1988. That November, he was traded to the Twins in the deal that sent Bert Blyleven the other way. With the Twins, Wassenaar played 1989 between single-A Visalia and AA Orlando. At Orlando, Wassenaar made a brief attempt at starting, before returning to relieving for 1990. 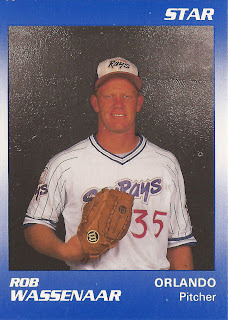 For 1990, Wassenaar returned to Orlando, getting 52 appearances and posting a 2.98 ERA. Wassenaar helped close-out rival Huntsville that May, picking up a win in relief as Wassenaar's team took the lead. "After we scored to runs in the bottom of the fifth, that took a lot of pressure off," Wassenaar told The Sentinel. Wassenaar got his first look at AAA in 1991, with 40 games at Portland. He then returned to AAA in 1992 and 1993, in the Giants and Rockies systems, but he never made the majors.